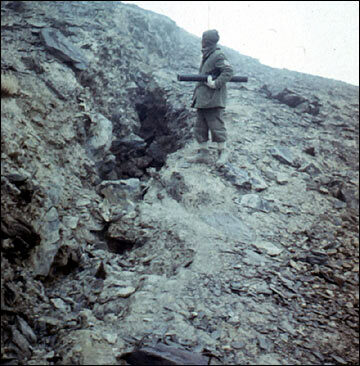 During 1967-1991 in the area of Lake Sarez the organizations of the PO “Tadjikgeologia” – an engineering-geological team of the Southern Hydrogeological Expedition; Pamir geophysical team of the Southern Geophysical Expedition; topographic surveying team of the Tadjik Geology Surveying Expedition - have been carried out a great amount of field investigations. A relatively small part of field works there was fulfilled by VSEGINGEO (All-Russian Research Institute of Hydrogeology and Engineering Geology) (Moscow Region); “Soyuzgiprovodchoz” Company (Moscow); Company “Gidroprojekt” (Tashkent); M.V.Lomonosov Moscow State University; geodetic and hydrographical teams of the State Cartography Department of the USSR; hydrological team of Hydro-meteorological Survey (Tadjikistan). The investigations were stopped in 1991 due to the breakdown of the USSR. 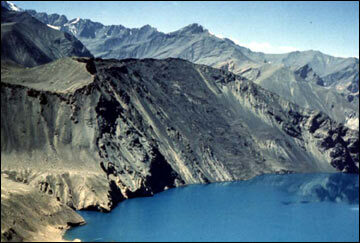 Sarez Lake has reminded of itself in 1994 by an abnormal increase in its water level during the flood. Thus, there was appeared the necessity to begin the investigations again. They were started in 1997, when the International Migration Organization and Government of Tadjikistan convened in Dushanbe an international conference on Lake Sarez. In June 1999 the Secretariat of the UN International Decade for Natural Disasters Reduction and other organizations have carried out a very short reconnoitering examination of Lake Sarez. Basing on the results of this examination an International Project on the Lake Sarez Risk Mitigation for 2000-2006 was prepared. 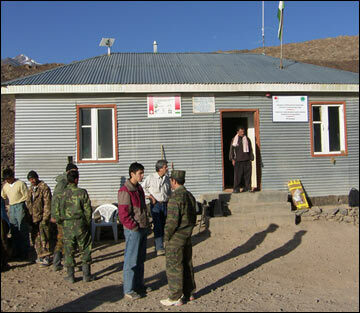 The participants of the project were the Swiss Company “STUCKY” and TISSC AN RT (Tadjik Institute for Seismology and Antiseismic Construction of Tadjik Academy of Sciences). The participants presented their vision of the given problem on the joint Swiss-Tadjik website www.sarez.by.ru (www.sarez.tj) that was organized and sponsored by the Swiss Office for Cooperation in Tadjikistan. The administrator of the website is Bakhtier Faiziev - the Programme Coordinator of the above-mentioned Office. A big part of geological information was prepared by A.R. Ishchuk – a worker from TISSC AN RT. The Project is described in the broshure of N.R. Ishchuk “Lake Sarez: Project on Risk Mitigation”. All these informational materials were discussed at the Conference held in Dushanbe in 2003. In 2004 the TISSC AN RT Director, S.H.Negmatullaev presented a report at the Anniversary Conference devoted to Academician M.A. Sadovsky, at the Institute of Earth Physics in Moscow. A major part of the report concerned the International Project “Lake Sarez Risk Mitigation”. 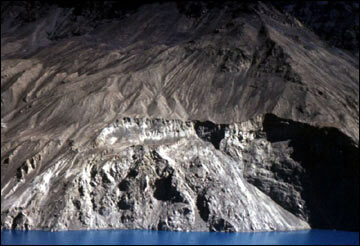 The results of the Project were presented in the article of American geologists Robert Shuster and Donald Alford: “Usoi Landslide Dam and Lake Sarez, Pamir Mountains, Tadjikistan» (2004) and in the article of Patrick Droz - Usoi Object Chief Manager from STUCKY Company: «LAKE SAREZ RISK MITIGATION PROJECT: A GLOBAL RISK ANALYSIS». On May 22-23 this year, the second international conference was held in Dushanbe, which was devoted to the Sarez Lake safety. Participants of the conference were authoritative representatives from Tadjikistan, experts from Germany, Iran, Kirghizia, Russia, Turkmenia, Turkey and Uzbekistan. The Conference summarized and approved the results of the World Bank Project “Lake Sarez Risk Mitigation for 2000-2006”. A special attention was paid to a proposal of the Tadjik Authorities on usage of “17 cubic km of the purest water from Lake Sarez”. I would like to tell in my paper about myths and realities of a new phase of investigations of the Sarez Problem. MYTH 1: «Results of all the investigations carried out during more than 20 years (since 1997 till 1990) in the area of Lake Sarez – this is a mixture of miscellaneous facts differently interpreted by different researchers, a combination of various hypotheses and suppositions». This statement can be found on the website www.sarez.by.ru It sounds like a refrain in all the listed publications. Usually, in order to carry out any field geological investigations, one needs a working hypothesis, and then planned investigations should confirm or deny it. This is an ordinary process during any research. It is natural that an author of any hypothesis must precisely indicate what to do for confirmation of his hypothesis, and only after the confirmation is obtained, this hypothesis will become a fact. A hat off to the author of the hypothesis if he could give at least a right direction for the investigations. There is a type of geological works – generalization of research results of past years. Multi-year investigations of any object accumulate facts which change the outlook of authors on the object under investigations. In parallel, the same object is studied by specialists of versatile professions and other organizations. New data of similar investigations in other regions are being accumulated. Now it is chanced so that authors of investigations are provided with time and funds in order to analyze once more all the informational materials, discuss the obtained results with experts of versatile disciplines, treat field data with the use of new computer technologies and so on, and only after all this to prepare a new report - this is a well-taken and widely used practice. At the conference of 1997 a proposal was expressed: to give the possibility to the former researchers to generalize their materials. It would be of sense to make generalizations on geological, geophysical, hydrological and geodetic investigations, to carry out an analysis of engineering projects. Then the summarized results should be translated into English, because it was planned to recruit English-speaking participants for investigations. It was needed, in order new participants would know what was done, what work was started, but not yet completed, and what more must be done. Only in this case the reports could be reviewed, and new researchers would have a moral right to criticize them. As an author and executor of all the geophysical investigations performed in the area of Lake Sarez, I personally offered at the Conference of 1997 and several times later my assistance in generalization of geophysical and hydrological data, but did not find any support. The World Bank and Federal Geological Survey of USA provided funds for the works on data generalization. But the first-hand executors did not obtain any grants. Thus, the organizers of new investigations themselves have created their difficulties which they did not overcome till now. 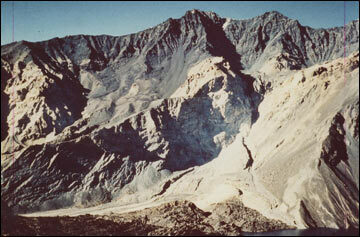 The Right-Bank Landslide is one of the hazards for the slide-rock dam of Lake Sarez. The size of the landslide and velocity of its displacement determine the height and size of an overflow wave, which will appear if the landslide is collapsed. The volume of overflowed water and the degree, to which the slide-rock dam will be damaged, depend just on the above-mentioned parameters. The first prediction of water volume (Sheko,1968), 2 km3, was made basing on the results of route and aerovisual observations. After that a complex of works was performed: engineering-geological, topographical and crack surveyings of the landslide surface, stationary geodetic observations, geophysical investigations, drilling of a borehole. In 1981 V.S. Fedorenko determined the size of the Right Bank Landslide as equal to 0.9 km3. In 1990 Yu.M. Kazakov, N.R. Ishchuk, Yu. Akdodov (TadjikNIINTI Issue “Modeling, determination of sizes and qualitative assessment of sliding slopes”) have calculated that the size of the Right Bank Landslide is 0.633 km3, its average thickness – 141 m.
In 2002 A.R. Ishchuk, N.R. Ishchuk and S.H. Negmatullaev (A report in the Institute of Earth Physics in Moscow) have reported on the basis of the same data that no landslide exists. However, they were not pioneers in making such a statement: YU.A. Mamaev - the former geologist of “Soyuzgiprovodkhoz” Company – in the cloakroom of the conference of 1997 was asserting the same idea, but did not give me any explanations for this, having promised to write an article on this topic. But no article has been written yet. 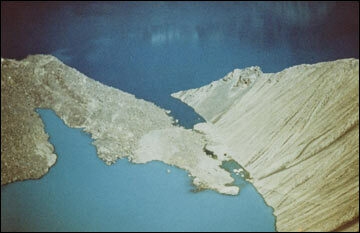 Robert Shuster, Donald Alford and Patrick Droz accepted the landslide to be equal to 0.5 km3. 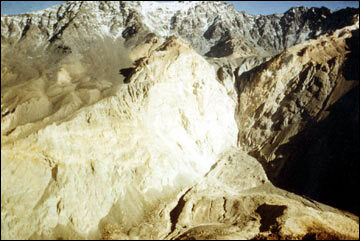 The Ministry of Emergency of the Republic of Tadjikistan (Information for European-Asian Union countries, 2006) considers that there are two landslides on the slope, each equal to 0.6 km3, with a hazard coming only from the north-western one. And the given conclusion is also made on the basis of the same data. All the geological ideas on the structure of the Right Bank Landslide are usually based on the biased opinions. As many are geologists and so many are hypotheses. Furthermore, if one geologist (like, for example, N.R. Ishchuk) looks twice at the Right Bank Landslide, he will have already two hypotheses. Non-biased informational materials on the Right Bank Landslide are only those data that are obtained from the single borehole, seismic cross-sections for seven profiles and geodetic measurements within a network of ranging marks. Unfortunately, these materials were ignored by geologists as considered to be contradictory to their own hypotheses. 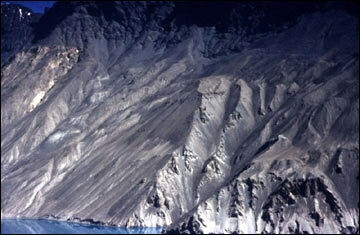 According to geophysical data of 1983-1985 and 1976, the displacing (or sliding) surface of the Right-Bank and Usoi landslides is the roof of hard metamorphosed rocks, which is clearly registered by the intensive refractive boundary (with a velocity of longitudinal seismic waves, equal to 6500 m/sec). The steepness of this surface, like at the Usoi Slide-Rock Dam, in the upper half of the slope reaches 40°-45°, in the lower half - 22°-25°. The size of the landslide is 1.25 km3, average vertical thickness is 250 m, the maximum one - 350 m. The similar idea on the Usoi landslide displacement and on all the landslides of the right-hand shore of Lake Sarez along the roof of dense metamorphosed rocks was reported by V.E. Minaev at the conference of 1997. By the way, he was not familiar with the geophysical data and made the given supposition only on the basis of geological observations. The expected displacing (sliding) velocity of the Right Bank Landslide is not less than 24 m/sec, i.e. 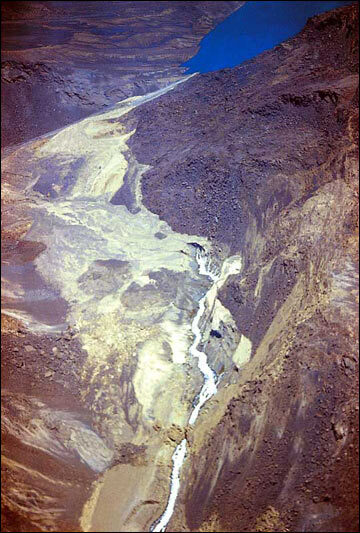 the same as of the Usoi landslide. In the upper part of the Right Bank Landslide two intermediate sliding surfaces are revealed with slower boundary velocities. The total size of the cover composed of looser sediments is 0.5 km3. On the Right-Bank slope, there were carried out stationary geodetic measurements by a network of ranging marks. Unfortunately, geodetic specialists did not generalize these measurements. The authors of the hypothesis on absence of the given landslide state that only the top layer is displacing, just within which the bench-marks are installed, but they do not give any mathematical substantiation of this. Personally, I did not manage to find any correlation between the bearings of the benchmark displacement vectors and bearings of maximum slope of the surface relief in these points. The single borehole, drilled in 1986, has a casing, installed to a depth of over 50 m. At bench-marks 100 and 101 – the nearest ones to the borehole, the annual (in plane) displacement is 0.110-0.120 m. During a period of 1986 to 2006 it should reach 2.2-2.4 m. Such a displacement of the top layer would cause a bent of the casing and a rock deformation near the borehole mouth. In October 2006 Rustam Yusufov – a geologist from the Southern Hydrogeological Expedition - and me examined the borehole mouth and did not find any rock deformation and casing bent, i.e., thus, no displacement of surface sediments happened. In 1986 a cable benchmark was installed in the borehole at the depth of 178 m. The cable benchmark did not show any bending during several years of observations. This fact indicates that the displacing (sliding) surface in the borehole lies at the depth of over 178 m, and the size of the Right Bank Landslide is not less than 0.9 km3. In this case the volume of the overflow wave during the landslide collapse will be approximately 100 million m3, which would mean a gigantic catastrophe even if the Usoi Slide-Rock Dam would not collapse. All these contradictions were clear in 1997. Therefore, if the authors of new investigations would want to analyze the hazard of the Right Bank Landslide, they would rely not on a new visual examination of it, but on the up-date technologies for determination of displacing surfaces. The borehole, that was drilled in 1986, was not suitable for carrying out any investigations in it even at that time. Therefore, it was necessary to drill in the same site a new borehole to a depth of 300 m, using a modern demountable rig. The top part of the borehole, where the rock is the loosest, should be immovably cased in metallic tubes to a depth of 50 m and the most detailed logging investigations and seismic works by the method of vertical seismic profiling would be conducted in it. After that, the borehole should be cased by plastic tubes up to the borehole face and then periodically carried out inclinometric and cavernometric measurements along the entire borehole length. The bent of the borehole and a change in its diameter will make it possible to determine precisely the position of the displacing surface. This technology is used now to study landslides that Vitter a threat to a very important objects. Logging investigations will enable obtaining a detailed characteristics of strength and dynamic properties of rocks along the borehole, performing of geological referencing of refractive boundaries established by means of seismic surveying. A new borehole should have been drilled for precise determination of the displacing surface position, volume and displacement velocity of the landslide within the “Project on the Lake Sarez Risk Mitigation for 2000-2006”. MYTH 3: «Arguments on a full collapse of the Usoi Dam and a gigantic flood sweeping away the valleys of the Bartang-Pianj-Amudaria Rivers and demolishing everything on its way up to the Aral Sea - are simply groundless conclusions of "specialists" who are far from understanding the real scope of the problem». In reality the matter of facts is far from truth. The professional researchers never said such a nonsense. There are two hypotheses on formation of the Usoi slid-rock dam. The authors of the both hypotheses outlined that the dam is generally stable, but a water overflow will cause a closure channel in its northern weakened part. The velocity and time of washing out of the closure channel were proposed to be different. At the same time the supporters of the both hypotheses suggested to conduct the most detailed investigations and drilling works in the northern rear weakened zone, where a closure channel is expected, and outlined that only then a final conclusion could be made on the stability of the landslide. 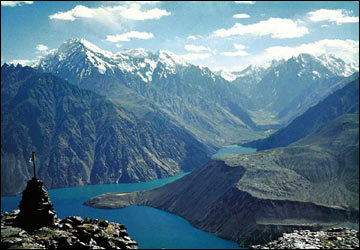 Closure channels in all the ancient slide-rock dams ever happened in the Pamirs are located in their rear part. But it is not known what velocity they had. In order to create a catastrophic water breakthrough, a closure channel of 20-30 m wide or a series of large cracks would be enough. The author of the first hypothesis was Dr. Sci. A.I.Sheko – the Head of Engineering Geodynamics Sector, VSEGINGEO Institute (1970). 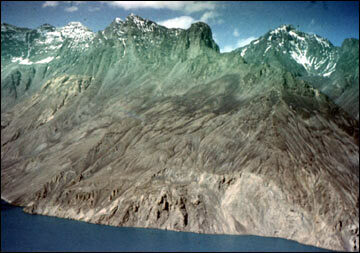 He supposed that after the Usoi landslide stopped, its basic rock mass was broken in two parts. Its northern part began moving in the opposite direction, but did not reach the surface of tearing off. Thus, a rear sink was formed there, which then was filled with collapsed and mudflow sediments. In case of water overflow, a closure channel appears in this sink with a depth quickly reaching 100 m (from the present-day lake level) and may be much deeper. This is a pessimistic variant. Based on this hypothesis and analyzing the results of geological and topographical surveyings, decoding of aerophotos and aerovisual observations, A.I. Sheko and A.M.Lekhatinov have compiled the map of Usoi Landslide dynamics on a scale of 1:5000. This detailed map is the illustration of the first hypothesis. The second hypothesis was suggested in 1981 by Dr. Sci. Fedorenko – the Chief Researcher of Engineering Geology Sub-Faculty, M.V. Lominosov Moscow State University (MSU), basing on the same data used for the first hypothesis. 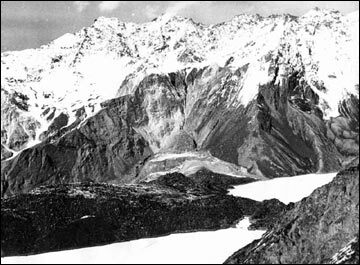 Dr. Fedorenko considered that after the basic rock mass had stopped, the collapsed sediments were moving up- and downward the valley, but not in the reverse direction, and that the Usoi Landslide had, instead of a rear sink, rather a more denser core in the crest place of its lowered part. The weakened zone is composed of big blocks and rocks overlain by mudflow sediments. He considered that a water overflow will break the dam crest in the mostly lowered part, which will be followed by a slow erosion, washout of the dense core and gradual liquidation of the lake, i.e. the same closure channel will appear, but water drawing from the lake will proceed slowly. This is an optimistic hypothesis. The hypothesis was approved by the Geological Sub-Commission of the USSR GOSPLAN during examining the research results on Lake Sarez in 1988. After that many geologists began to consider the hypothesis as a fact, though V.S. Fedorenko himself wrote: “This is a working hypothesis of MSU Engineering Geology Sub-Faculty and Southern Hydrogeological Expedition of PO “Tadjikgeologia”. But V.S. Fedorenko did not compile a map, which illustrates his hypothesis, and did not take into account the results of the geophysical investigations of 1975-1976. So, the direction, in which big blocks were moving after the break of the basic rock mass, is still unknown. However, this small detail completely changes the stability assessment of the northern weakened zone and determines the scale of an expected catastrophe. 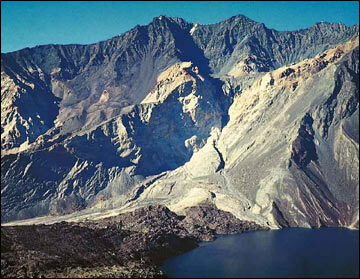 Integrated geophysical investigations of the Usoi Landslide were carried out in 1975-1976 on a scale of 1:10000. With the aid of gravimetric surveying, two weakened zones with a lowered density and a high rock porosity were distinguished at the dam. The northern zone coincides with the above-mentioned rear part of the landslide. The second zone located in the dam center is linked with the ways of water filtration. In 1977 based on the analysis of the data of the Tadjik GMS, I have made a prediction that the average multi-year water level of Lake Sarez increases annually by 0.2 m and that eventually it will reach permeable sediments, causing a natural washout of the dam and, hence, the catastrophic flood. In 1987 in the lowered areas of the Usoi dam at the joint of the rock masses, geologists from the Southern Hydrogeological Expedition have revealed disconnected permafrost areas and two linear zones of the ice manifestations concentration. Ice melting can also pose a danger for the dam stability. All these relevant problems concerning the dam stability were clearly seen before 1997. To solve them, carrying out integrated investigations of the dam area, covering about 5 km2, on a scale of 1:2000, were needed. All these problems could have been settled within the “Lake Sarez Risk Mitigation Project”, but they remained open. SOYUZVODPROJECT Institute under the leadership of L.I. Poladzade were working for a few years on the evaluation of damages that could be brought to the national economy of the USSR from an outburst flood from Lake Sarez. The prediction of this group of experts was much sadder as compared with the last conclusion of the Ministry of Emergency of Tadjikistan. Indeed, it is presently impossible to determine when the Sarez catastrophe will happen – tomorrow, in hundred years or, maybe, much later. There is no one among the living people who could be eye-witnesses of a similar catastrophe, and, hence, all these warnings seem unreal. I shall give an example about a landslide of the same name near the Baipazinskaya Hydro-Electrical Plant on the Vahsh River. 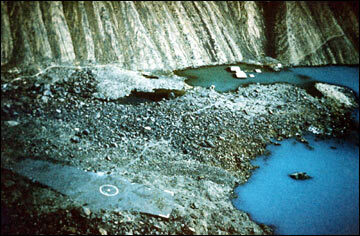 In 1993 and 2005 I took participation in the geophysical investigations of this landslide. Displacements of the sliding rocks blocked the river in 1992 and 2002 and posed a real threat to flood the machinery room of the Plant. The landslide is now under continuous engineering-geological and geodetic observations. It was studied with the aid of borehole drilling and by geophysical methods; the upper part of the landslide was released. However, in spite of having this information, still no one will undertake to guarantee that no new motions or displacement of the whole landslide will happen. An extreme caution can be found in all the predictions of experts, as they have already witnessed these events. Therefore, the people responsible for the safety of the Baipazinskaya Hydro-Electrical Plant say: “Why to wait, make optimistic or pessimistic predictions, to carry out observations, to worry? It is necessary to dig a short dry tunnel of a large cross-section on the opposite bank of the Vahsh River. In case if the river channel is blocked again by sliding rocks, the water flux will move through the tunnel, without causing any hazard”. The scale and complexity of the Sarez problem is not comparable with the Baipazinskaya one, but still it requires to find engineering solutions that could provide the safety in any case. Thus, now there are no reasons to speak about an achieved decrease of the risk or to state that no catastrophe will happen in the nearest years. Simply the low probability of a catastrophic event make the people, like, for example, Ghulsara Pulatova, feel inspired and make irresponsible statements and predictions. Recently, journalists of Tadjikistan and Uzbekistan started excitedly speak about the use of 17 cubic kilometers of the purest Sarez water for water supply, making a point based on the representation of the authors of the Project. It is already planned to construct a 600 km pipeline to Lake Sarez and to provide 25 million people with water; a huge profit was calculated. I would like to disappoint the enthusiasts of this idea. The purest water exists, but the volume for a long time is not 17 km3 already. 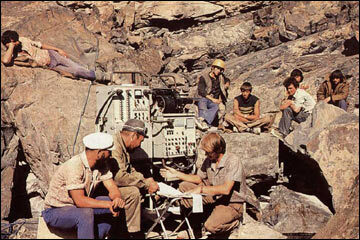 In 1976, 1989 and 1990, using special equipment, highly precise measurements of water temperature and mineralization were carried out in the Sarez and Shadau Lakes. 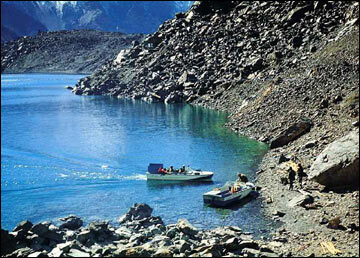 The water mineralization in Lake Sarez within a depth interval of 0 to 50 m was equal in 1975 to 280 mg/l. It was increasing below this depth level, reaching 1130 to 1150 mg/l at a depth of 250 m and deeper. During the past 30 years the value of mineralization increased. Now, it is equal to 1380-1490 mg/l in the stagnant zone of the lake. Thus, the ultra fresh water with a mineralization of 250 to 280 mg/l in both lakes has already not a volume of 17 km3, as earlier expected, but only 4-5 km3, and it is located in the upper water-running parts of the lakes. If the water levels in the lakes decrease by 50 m for safety purposes, then no fresh water will remain in them. But the quality of even this remained water can soon be considerably deteriorated. Lake Shadau is hydraulically linked with Lake Sarez through a cofferdam. The water color in Lake Shadau is greenish; fish in it is infected with tapeworms, which is typical of stagnant or low-flowing water bodies. This means that the lake is a source of infection, which is known for a long time (I know it for 30 years), but Tadjik biologists keep silence about this. There is one problem more. The Government of Tadjikistan has issued a license for development of the large silver deposit Ak-Djilga on the North-Alichursky Ridge. The deposit development will cause a threat of penetrating industrial waste waters into the Ak-Djilga River, then into North Bazardaru – a left-hand tributary of the Murgab River, and finally into Lake Sarez. And again Tadjik ecologists keep silence. Thus, again there is a Myth, and again the precise data on the nature and natural resources are ignored, because the truth prejudices the “flight” of amateurish fantasies. 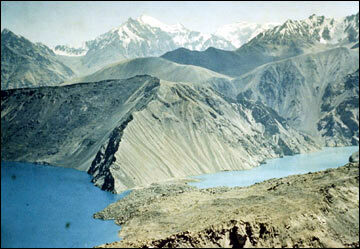 The system of early warning and monitoring was arranged at the Usoi Landslide Dam and in the western part of Lake Sarez. Location of the monitoring station is very convenient for visual observations behind the dam and controlling the measuring gauges. Constant communication is set with an operator in Dushanbe. But it is necessary to mention the following thing. The location of the observation station was selected proceeding from the assumption that the size of the Right Bank Landslide and velocity of its displacement are small and the outburst wave, caused by the landslide collapse, will be weak. But there are some reasons to doubt this assumption. If the collapsed rock mass from the Right Bank is more than 0.3 km3 the water wave will destroy the observation station, radio-station and antenna. Thus, the warning signal will not be transmitted because of interruption of communication with the station, and the entire warning system will not work. The same will happen due to falling the Left Bank Landslide into the lake and landslides in the sinkhole of the Usoi Slide Rock Dam. So, the warning system is not intended to warn about a full-scaled catastrophe. By the way, the height of the “safe islands” above the water line is not enough in case of full-scaled catastrophe. 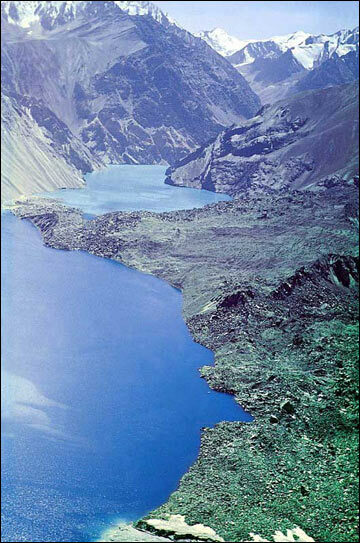 Having read the article of American geologists Robert Shuster and Donald Alford “Usoi Landslide Dam and Lake Sarez, Pamir Mountains, Tajikistan” (2004), I was pleased to learn that they know about my proposal how to decrease the water level in Lake Sarez –by increasing the filtration. And moreover, they consider that this is the simplest and the cheapest technique to increase safety. But they learnt about this technique not in Tadjikistan, but in Journal “Science in Russia”. The idea appeared 30 years ago. I tried to awake Tashkent Hydroproject Company and Soyuzgiprovodkhoz interest in the proposed technique; I reported about it at the conference of 1997; I wrote letters to the Sarez Agency, Ministry of Emergency of the Republic of Tadjikistan, and to the Project Coordinators. I did not find a support anywhere and understood that Tadjikistan did not need cheap techniques for keeping Lake Sarez in safe state. I am also glad that Patrick Droz (Article «LAKE SAREZ RISK MITIGATION PROJECT: A GLOBAL RISK ANALYSIS») knows about this technique. I do not agree with the authors of both articles concerning the assessment of the Right Bank Landslide. So, the article of Patrick Droz presents the modeling results for the size of the landslide as equal to 0.5 km3, but the velocity of its displacement is underestimated. It is not known why no modeling results are indicated for a larger landslide size and larger velocities of displacement. Figure 5 in the same article shows a relationship between the water level in Lake Sarez and water rate at the Barchadiv hydropost. The author has revealed that at the same water levels in the lake, the water rates are different depending on whether the lake is being filled with water or it undergoes depletion. However, 30 years ago in the report of 1977 I described this phenomenon in more details with indication of the reasons explaining it. Also, I reported about this phenomenon at the conference in 1997. There are no special claims to the rest materials. But all what is written in the articles had been already known before 1997, and there is none fundamentally new information in them. Moreover, the authors left beyond attention the long known Left Bank Landslide, which, in spite of its smaller size (0.15 km3), has for the Usoi Dam and observation station not lesser, but, maybe, a larger danger, as compared with the Right Bank Landslide. There were not mentioned the landslides in the sinkhole of the Usoi Dam, that were revealed by L.L.Kozlovsky, a geologist from Soyuzgiprovodkhoz in 1988, based on the results of the route examination (by several alpinist ascents up to the watershed part of Muzkol Ridge), treatment and decoding of aero- and cosmic photos. On the upper western slope of the sinkhole two potentially unstable areas were distinguished with a total size of about 0.7 km3 and a height of gravity centers above the sunken part of the dam of over 1000 m. It would be difficult to estimate consequences of the dynamic influence upon the Usoi Dam in case if these areas collapse. Their collapse can have both positive and sharply negative actions on the dam with destruction of it and maximum catastrophic consequences for the valleys of the Bartang-Pianj-Amudaria Rivers. Besides, the collapse of the unstable areas may result in the same earthquake as in 1911. Generalization of data of the earlier engineering projects was not carried out. Therefore, the authors of the Project represent two schemes as their own: (1) decrease of the lake water level by means of tunnels and (2) increase of the dam height. Here, the Project authors do not take into account the existing geological problems. In the Soviet time the schemes were studied, but later they were rejected as unreal. Proposals appeared in the recent time to decrease the water level in Lake Sarez with the aid of a floating pump station and the method of a interceptor. In the Soviet time, in order to realize these schemes, the projects were prepared, but they were also rejected by expertise as unreal. The authors do not know about other more prospective schemes for engineering solution of the problem. The website was created to advertise the International Project. The website contained arrogant statements and clear disrespect to the former researchers of Lake Sarez. All the geological achievements became suddenly nameless. Due to the criticism, the general chapters were repeatedly changed. In May 2006 in Dushanbe I have met with the administrator of this website Bakhtier Faiziev in the Swiss Office for Cooperation in Tadjikistan. Below is my talk with him. LP: Which actions will be carried out to mitigate the Lake Sarez risk within the advertised Project? BF: No any actions are planned to mitigate the Lake Sarez risk within the given Project. The Project was simply named like that. LP: Why there is such an insulting relation to the former researchers on your website? BF: You have carried out a great amount of investigations and it was easier for you to obtain at least some results. We cannot advertise your results for our own money instead of the results of our research beginners. LP: Chapters «Geophysical investigations” and “Hydrology” are written totally unprofessionally. If you have no specialists, then why not use my reports presented at the conference of 1997 or my other articles on this topic instead of them? BF: We do not have the right to publish other’s article without the permission of the author. That is why we decided to manage with our own forces. LP: I demand to remove this nonsense about my works from the website immediately! BF: At the present time I cannot do it, as we have already passed the website to the Ministry of Emergency of Tadjikistan. And the geological information on the website is under responsibility of workers of TISSC AN RT. I could not clarify at the Ministry of Emergency of Tadjikistan who is now the administrator of this website. Now, I shall try to make a short overview of the information given on the website by May 3, 2007. For example, A.R. Ishchuk from TISSC AN RT decided to prove that the Right Bank Landslide is absent or almost absent and that with its collapse into the lake the outburst wave will be minor. In the time of Internet provides the possibility to communicate quickly with the authors, ask for their permission and publish their information on the website and then to conduct debates, referring to conclusions and opinions of authors, or simply to indicate exact addresses where one can find this information and read, and then to refer to it during the debates. But instead of the actual articles, we have to read the comments of A.R.Ishchuk on the geodetic measurements, geophysical investigations, models of wave formation without references to originals (without having any permission from authors and not being a specialist in given spheres). And after arguments with himself, A.R. 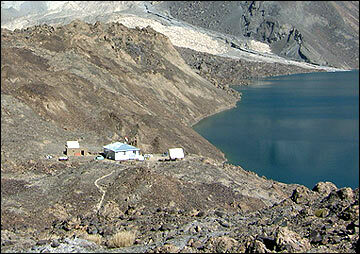 Ishchuk makes a conclusion that the sliding surface of the landslide is not revealed, that is why it is absent. Just this is typical of the Section “Recent Investigations”. The present-day methods for management of serious projects recommend at the first phase of works to create an electronic data bank. If the website, instead of containing illiterate comments, contain articles and reports of the researchers who carried out real field investigations in the Sarez area, then, eventually, such data bank will be created. Only then it would be possible to conduct the website debates on the aspects of the problem at the professional level. So, the level of culture of the advertisement of the International Project does not differ from the advertisement of some sorts of milky bars, fizzy drinks and so on. The system of warning and monitoring was created. The system cannot work during a full-scaled catastrophe. Therefore the system must be upgraded. For this, it is necessary to install a duplicating observation station which would continue to work in case when the basic one will be destroyed in a point, absolutely inaccessible for an action of the as high as possible outburst wave. The Project is called international, but nobody knows why it does not have any direct radio-communication with the Departments of the Ministry of Emergence in Termez, Chardjou, Nikus and Afghanistan. No any new information was obtained on the works carried out. The authors of a new phase of investigations could not manage with all the geological data available by 1997, and many of hazards for the landslide dam of Lake Sarez were remained beyond the field of their vision. The proposed variants of engineering solutions of the problem have been already studied earlier by Russian organizations, but, based on geological conditions, they were rejected by the expertise as unreal. Till 1997 the coordinators of the Project – the workers of the Swiss STUCKY Company and TISSC AN RT did not have an experience in the given kind of works and fundamentals of the problem of Lake Sarez. Presently, due to mass departure of specialists, the Southern Hydrogeological Expedition, Southern Geophysical Expedition, Tadjik Geology Surveying Expedition (i.e. the organizations of PO “Tadjikgeologia”) cannot continue investigations in the Lake Sarez area. Since 1997 the niche of these organizations in the Sarez problem is occupied by TISSC AN RT. 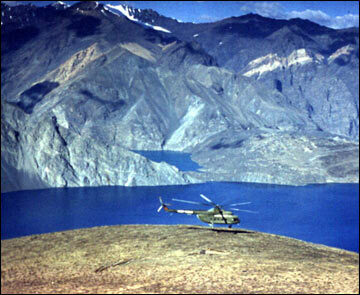 During a period of 1968 to 1988 the Administration of PO “Tadjikgeologia” not once suggested to TISSC AN RT to carry out seismological works in the area of Lake Sarez, as at that time the practical organizations were not dealing with seismology yet. But the Institute Administration every time completely refused to do it. In 1988 V.S. Fedorenko as a scientific leader of the Sarez investigations from the Ministry of Geology of the USSR decided personally to convince S.H. 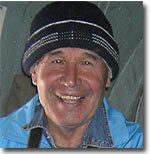 Negmatullaev, who was shortly before appointed the Director of TISSC AN RT, to participate in integrated investigations on the problem of Lake Sarez. S.H. 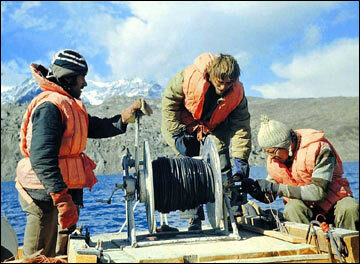 Negmatullaev answered the following to the given proposal: “Our Institute is academic, dealing with global seismology. And Sarez is a regional and purely research problem. We do not want to squander our resources on such trifles”. TISSC AN RT is really an academic institution, and the Sarez area requires to carry out practical investigations there in a very difficult conditions with the use of the most advanced equipment, which TISSC AN RT does not have. The investigations in the Sarez area require specialists in engineering geology, engineering geodynamics, engineering geophysics (i.e. seismic explorers, electrical explorers, logging experts, gravimetric workers, etc. ), engineering geodesy, hydrology, prospecting seismology, instrumental microseismic zoning, calculation of slope stability, mathematical modeling of landslide displacements, hydro-works. The specialists of such professions can not be found and never were in the staff of TISSC AN RT. STUCKY is a Swiss intermediary firm. It is a communicatee between the sponsors (World Bank, Government of Switzerland, etc..) and the research specialists (see website www.stucky.ch). The salary of American geologists is high. Therefore they were recruited to work only for several days for the purpose of advertisement of the Project. In order to understand geological problems in any geologically complicated region, any specialist should work there for at least several years. Thus, the Americans physically could not conduct any investigations in the area of Lake Sarez. For data obtaining and carrying out the geological part of works the STUCKY Company used the specialists from TISSC AN RT. Due to lack of financing of the academic investigations on global seismology, they agreed to conduct investigations in the Sarez area and became “experts” in all the issues at once. These “experts” replaced the field investigations and generalization of the old data by an elementary PR. The coordinators and leaders of the Project turned out to be functionally illiterate to carry out the complicated investigations, which just has led to the failure of the Project.